Paris at night, the Seine, a lamp, a man, and a tv, originally uploaded by Ted Drake. Paris is a wonderful place to be at night. The night takes on a blueish tint against the yellow lamps. There’s a peacefulness in the small streets and liveliness in the city center. It’s a place that inspires one to walk an extra 2 or 3 blocks just to avoid entering the bus, metro, or apartment. This photograph was inspired by an image by Henri Cartier-Bresson. 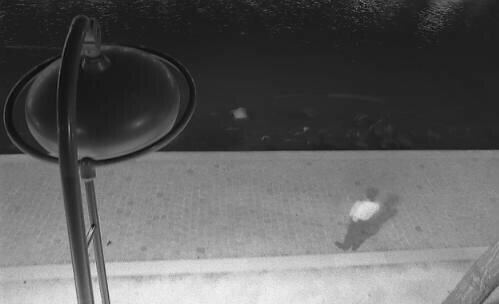 The object in the Seine is actually a television floating by the solo person. I believe this was shot on t-max 400 with a Nikon N70 and probably a 28mm lens.